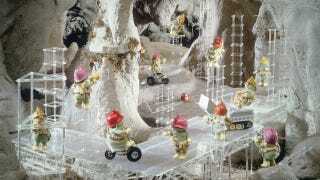 On the Jim Henson series Fraggle Rock, the hardworking Doozers were the foils to the always playful Fraggles. Now the Doozers are headed back to television, where they and their tiny construction hats will be the stars. The Jim Henson Company has greenlit production on a new Doozers TV show, based on the original Fraggle Rock characters. The press release doesn't reveal many details, but Bleeding Cool notes that when the series was first discussed way back in 2009, it was going to follow a crew of newbie Doozer engineers as they learn about teamwork, cooperation, technology, and eco-consciousness. Well, in Fraggle Rock, Doozer tools were powered by hydroelectricity, so it makes sense that these newer Fraggles would use green tech as well. I was hoping that these Doozers might mean we'd get a little Henson-style puppeting, but the Jim Henson Company is partnering with DHX Media, and the production is happening at DHX Media's CGI animation studio. That follows from the 2009 plan for a Doozer's television series. At least, though, we can take comfort in the idea that children will be getting some engineering protagonists on TV, characters who love nothing more than to build. Top image via Muppets Wiki.